Seriously, who wouldn't pick up a book chronicling the origin story of El Zorro, aka Diego de la Vega? The image of the swashbuckling bandit fighting for justice is one that has endured since 1919 for a reason. Having enjoyed Allende's The House of the Spirits, I could see no real reason to pass up the opportunity to try this incarnation of Zorro. From what I can gather, Zorro was written with the intent that it lead on cleanly into the old pulp novels, whilst being a lot more consistent and adventurous with its subject matter. The novel chronicles the first twenty years of Diego's life, including his first adventures as Zorro. That as an idea isn't a bad one; an origin story is always a good bet if you're looking to re-examine or re-invigorate an old character, as superhero movies can testify all too well. And this is an origin story that is written very well indeed. It has only one flaw. It starts far too slowly. When I say that Zorro covers the first twenty years of his life, the reader is presented with something from almost every single one of them. Much as I realise that a large chunk of it adds to the character development of the main character, it means that the first 150 pages or so are a lot slower, as his childhood in California unfolds. After he leaves for Spain, the proceedings do get more interesting though. If you can, I would stick out the slow beginning, because the warmth and humour that emerges as the story goes on are well worth the effort. The other, smaller issue that I have is that it ends in a way that feels almost incomplete: it makes sense to end where it does, but at the same time it's really obvious that you're supposed to find the original novels afterwards as a kind of "true" ending. The characters are incredibly well-written. The main ones that we follow throughout the novel are Diego, Bernardo and the de Romeu sisters. 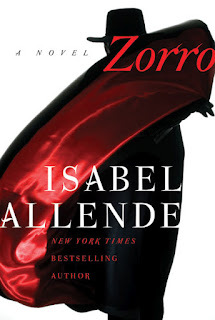 Diego, obviously our main protagonist, is pretty much everything you've come to expect from Zorro: handsome, dashing, cunning and with a strong moral core tempered by vanity. I was expecting more of a ladies' man, but that only comes in towards the end, when he is beginning to get more comfortable with his Zorro persona; before that his attempts at seduction and courtship are simultaneously laughable and endearing. Bernardo is Diego's brother in everything but blood, an Indian who acts first as his double, then, after an event that renders him electively mute, as his shadow. He was a nice enough character, but I didn't really find much about him to really get excited about: he is the rock that stops the other, more vivid characters from making the story too absurd. The de Romeu sisters are made up of Juliana, an innocent girl of extreme beauty and Diego's unrequited love throughout the majority of the novel, and Isabel, a tomboy who is as fiesty and dashing as Diego as well as a seriously good judge of character. Juliana wasn't really my kind of character: well-written certainly, but the kind of romantic that I tire of incredibly quickly. Isabel, on the other hand, was possibly my favourite character in the entire novel. It was her that I was rooting for, hoping against hope that she would get a happy ending.